It is always a tragedy when such a young life is taken so suddenly, but it seems even more tragic when that life is taken by something that could have easily been prevented. The 6-year-old boy who drowned on the Carnival Victory last weekend was said to have been swimming with his older brother in the pool. There are also reports of a parent being present at the pool at the time of the drowning. Now I’m sure you’re thinking right now that I think it’s the parents fault for not watching their kids closely enough; however, I am not placing blame on anyone, especially Carnival Corporation. I wasn’t there, and I don’t know what the parents were doing at the time, but as the mother of two very active boys I know they can get away from me pretty quickly if I don’t stay on top of them. Accidents can happen very quickly, and that’s just what it is: an accident. I also know from personal experience that young kids are not always supervised at the pools. We were on a Disney cruise and my son was punched by another boy who then ran and jumped in the pool to get away from my husband who was coming after him. When my husband got him out of the pool and went around the pool area looking for his parents, he could not find any claiming to be his. The boy said his parents were not there and didn’t know where they were. When we reported it to the pool supervisor, he tried calling the boy’s room and had to leave a message for them to call him back regarding their son. The call was never returned. Unfortunately, this is just another incident that is going hurt the Carnival Corporation because the mainstream media is only going to focus on the fact that they didn’t have lifeguards. My purpose for writing this post is to say that we have to stop being a society that is continually looking to blame someone else. We are always wanting to point the finger at someone else instead of examining ourselves because we refuse to take responsibility. How about we just focus on the fact that a little boy is gone, and his family will have to forever mourn his loss. Let’s stop worrying about whose fault it is. A Love For Travel is, in no way affiliated with Carnival Corporation. 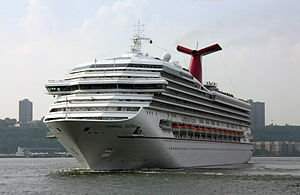 CNN Article: Florida boy drowns on Carnival Cruise. Previous Woman’s Day: Why they are Wrong about Travel Agents. Next I Love Hearing about the Vacations I’ve helped to Create!